Choose the right colors for this crochet ripple afghan and turn this traditional crochet pattern into a contemporary piece to adorn any space. 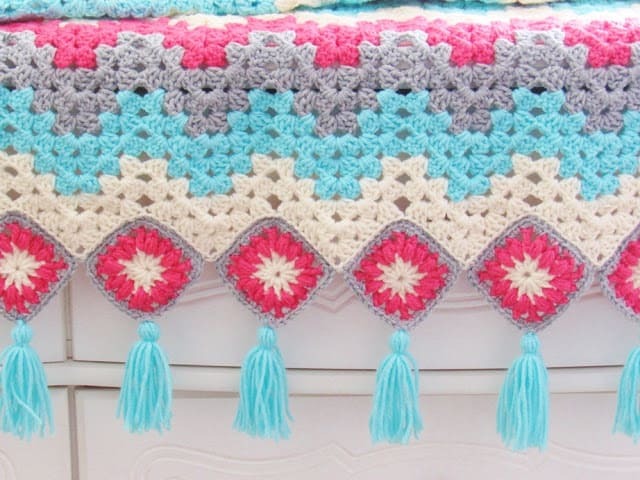 The granny ripple and granny squares have been combined to make this easy to work crochet afghan that brings spring right into your home. I am absolutely in love with this color combination and cannot wait to see what colors my readers will make this pattern in. 1. To increase the width of your blanket add chains in multiples of 36. 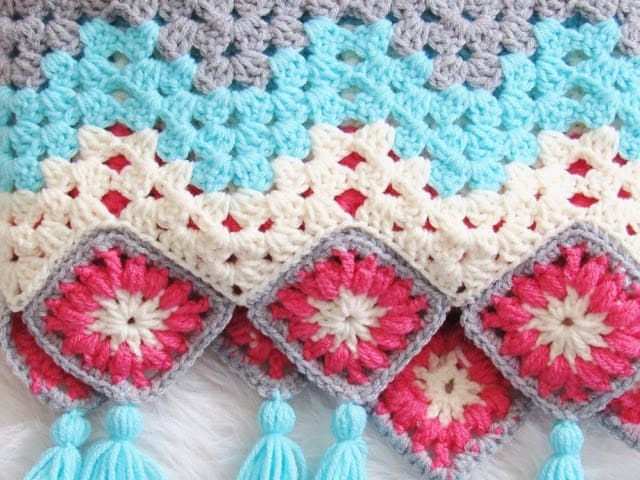 Each 36 chains will add around 8 inches to the width of your blanket. 2. When skipping your chains after making a peak, make sure you are not missing the one squished at the base of the previous st.
Repeat Row 2 changing colors every 3 rows. Fasten off every time you change colors. 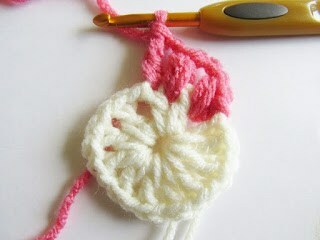 To join the new color at the end of your rows, start working the dc and when you have 2 loops on your hook, yarn over and pull through the new color to complete your dc. Then work the turning ch in the new color. Keep repeating the pattern until you have 17 stripes. Weave in all the ends. 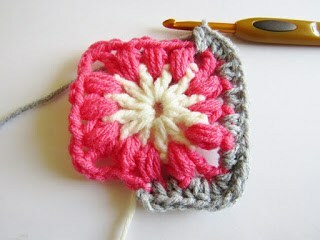 Note: I have written the pattern for the granny square as a photo tutorial to make the steps clearer. Puff Stitch: [YO, insert hook into the st or space indicated and pull up a tall loop about the height of a dc st] repeat a total of 3 times, YO and pull through all 7 loops on hook, ch 1 to close the puff st.
1. 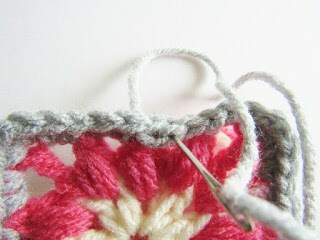 Work over yarn tails to minimize weaving in later. 2. 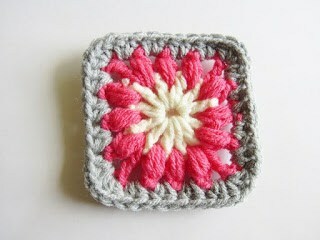 This is a picture tutorial as I thought it is best suited for a Granny square. Ch 4 and sl st to the first ch to form a ch ring. Sl st to the next ch-1 space and pull up the loop on the hook to the height of a dc. [YO, insert hook into the same ch-1 space and pull up a loop]twice, YO and pull through all the loops on hook,ch 2. Puff st in next ch-1 space, ch 1, 1 tr in next dc, ch 1. [*(1 Puff st in next ch-1 space, ch 1), repeat from * two more times, 1 tr in next dc, ch 1]. Repeat the steps within [ ], 2 more times. 1 puff st in last ch-1 space between the last dc and beginning ch-2, sl st to the top of the first puff st, picking up the gray color yarn. Ch 1 with gray yarn, 1 hdc in same st as ch 1, 1 hdc in next ch-1 space. Work 2 hdc in each ch-space and 3 hdc on top of each tr, do not sl st at end of the round. 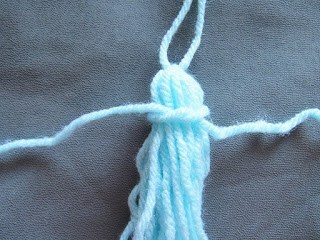 Cut the yarn and pull the yarn tail out, thread a yarn needle with the tail and insert it under the first sc and then into the first st to form a fake st ( shown in blue below). Weave in the rest of the tail. Cream(Aran) color yarn is used to sew the squares onto the blanket on the wrong side. 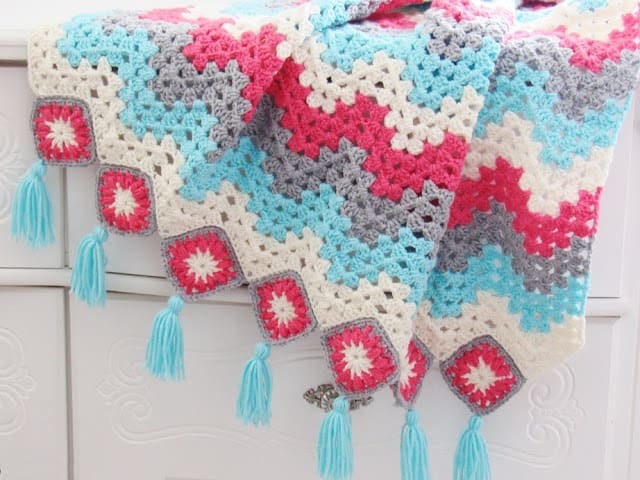 Keep both the blanket and the square with the wrong side facing up, place the square in one of the valleys at the edge, insert the yarn needle under both the loops of the blanket and only the back loop of the square, whip stitch them together along 2 sides of the square. Cut a piece of cardboard 4 1/4 inches long and 2 inches wide. 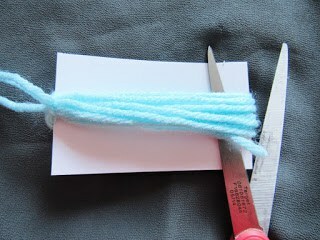 Wrap the blue color yarn around the cardboard 13 times. Pull an 18-inch piece of yarn through the windings and knot twice at the top. Cut the yarn along the opposite side. Take another 12-inch piece of yarn and tie a knot a little below the top knot. 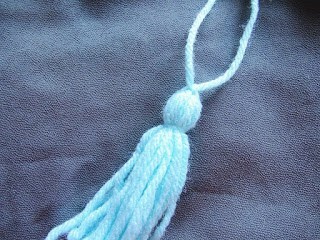 Trim the tassel to level the edges. 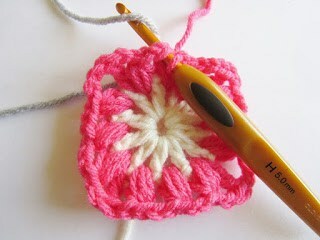 Use the 2 strands of yarn at the top to sew the tassel at the corners of the squares. 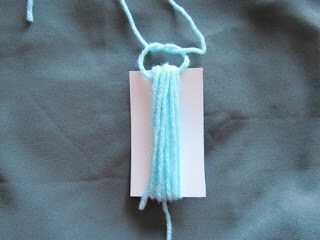 The remaining yarn tail can be pulled into the tassel and trimmed to blend in with the rest of the tassel. 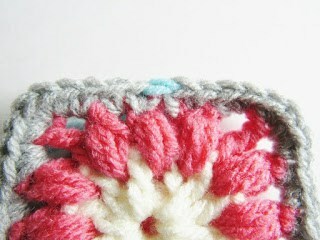 You might also like my Knit Look Chunky Afghan found here. See our full collection of patterns here: Pattern Gallery. 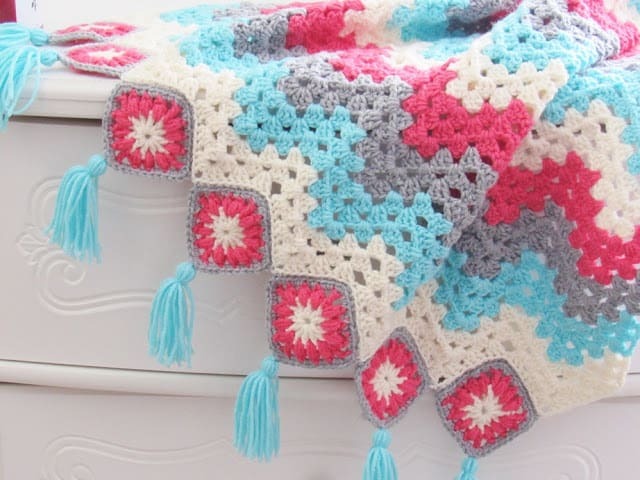 This afghan was featured on Allfreecrochetafghans.com. I love the color combination. It is so bright and cheery, it makes you want to smile. Your directions are clear and concise, and the photos are done very well. Great job. 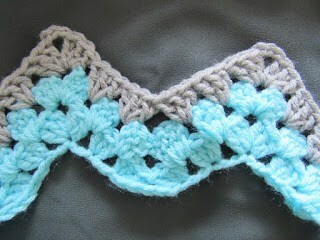 To increase the width of your blanket add chains in multiples of 36. Each 36 chains will add around 8 inches to the width of your blanket. I just edited the pattern to include this info. Thank you for visiting my blog. Have fun combining colors and thank you for visiting my blog. I live in AZ, too! I was thinking the same thing about the colors. What did you finally come up with? You are very welcome. I love my blog readers. It is your encouragement that keeps me motivated. Thank you. 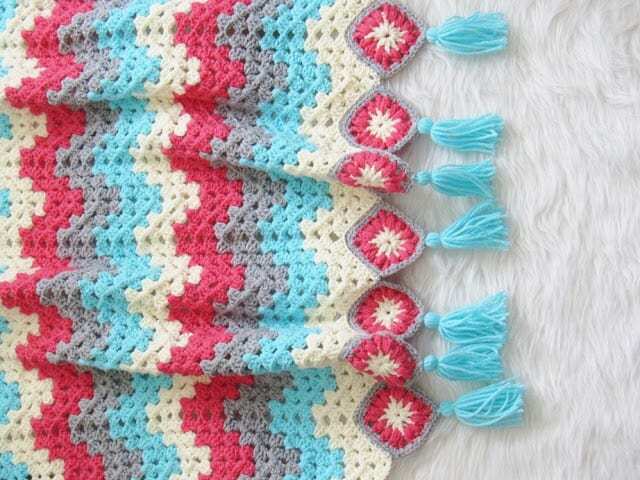 So wonderful blanket, dear! Lovely composition and color combination. I've pinned. Have a nice day! ???? Thank you so much, Anabelia. I am glad you like the pattern and I appreciate you sharing it. Really like the pattern but I am confused…why is there an odd number of squares needed? Shouldn't there be the same number on each end of the blanket? One edge starts and end with peaks. 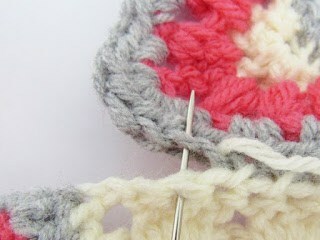 So it has lesser "V's to attach the granny squares. Love this and can't wait to make one! Why 15 granny squares? Shouldn't it be even? One side has one less valley to add the square to. If you take a good look at the pictures you will see what I am saying. did you add a border to this, or do you know what would be a good border? Nope, I didn't do a border on the sides. 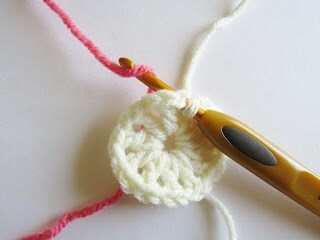 You can work a plain single crochet border or a reverse single crochet one. I would say keep it simple as the squares already add enough embellishment. It is beautiful I’m going to try my own colors but want to do same as yours in the future. I am wondering if you would have info on how to put a price on a project to sell it. Thanks, Beverly. I am glad you like it. I have seen blankets sell anywhere between 50-100 dollars. I would suggest you search on Etsy and see how similar blankets are priced. 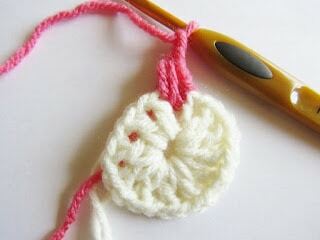 Has anyone tried this in a lighter weight yarn for a baby blanket? 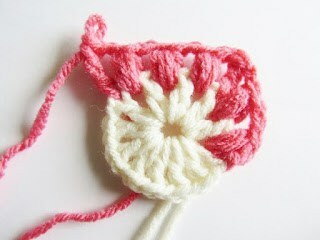 You can make a small gauge swatch and see how it looks in lighter weight yarn. Hi, i am very close to finishing my throw. I did use DK light #3 weight yarn. I think it looks perfectly fine. I’m making mine for a friend that can’t stand thick, hot throws. I think it would be fine for a baby throw. I used only 3 colors for the main part, so i did do the counts on my rows differently. I am glad you enjoyed the pattern, Tammy and I wish you a speedy recovery. Thank you for visiting my blog. Right at the end of the post is a blue box that will let you download a copy if you enter your email. You will receive email updates only if you check the consent form. Thank you for this pattern. 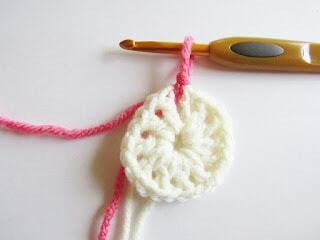 I am not a seasoned crocheter. When the blanket begins becoming bigger, the end of the rows of seem to just get bigger. Do I hae to start making a part that starts going up? The sides of my blanket are not straight. 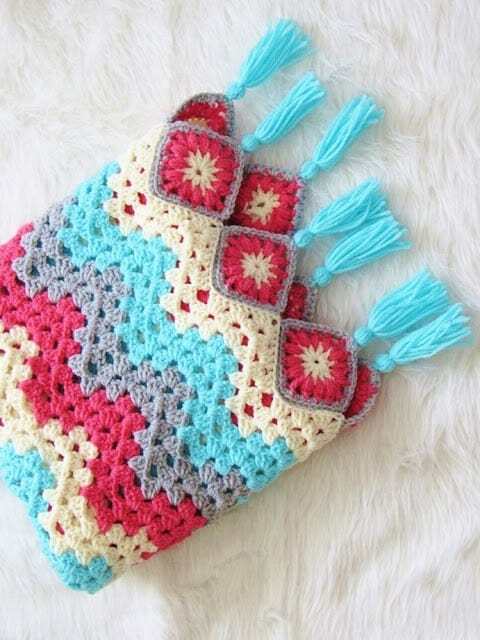 I chose this pattern because it is the easiest and most attractive of all the ones that I could find online. Can you help please? Can you email me a picture, please? 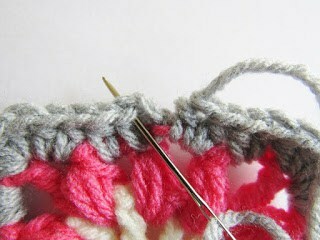 You must be adding stitches at the beginning or end.